A total of 64 different isolates of Actinomycetes were isolated from soil samples in Nakhon Si Thammarat. The anti-MRSA activity of Actinomycetes isolates was examined using agar plug and agar well diffusion methods. It was found that 19 isolates of selected strains showed anti-MRSA activity, there are only 10 isolates, namely, BA2, CK7, CK9, CK11, CO4, WU6, WU7, WU10, WU11 and WU14 which can inhibit all MRSA strains. 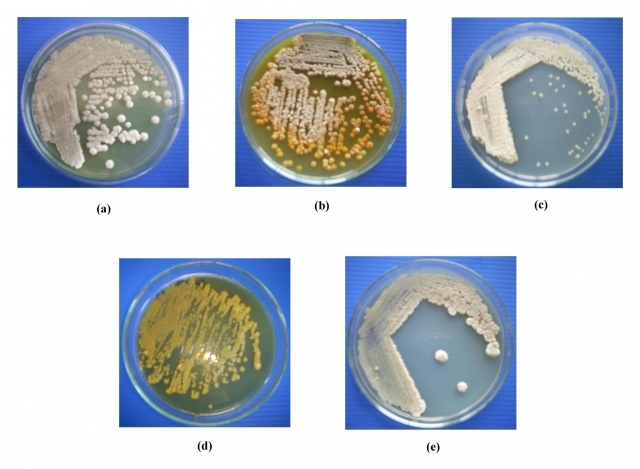 However, strains tested CK9, CO4, WU6, WU7 and WU10 exhibited the anti-MRSA activities on both agar plug and agar well diffusion methods. The taxonomic studies indicated that the isolates of Actinomycetes CK9, CO4, WU6, WU7 and WU10 belong to Streptomyces sp. CFJ2, Streptomyces antibioticus strain 1022-257, Streptomyces flaveolus strain NRRL B-1334, Streptomyces psammoticus strain NBRC 13971 and Streptomyces sp. b26, respectively. Actinomycetes, Anti-MRSA, MRSA, Streptomyces sp. PR Chadwick, N Woodford, EB Kacmarski, S Gray, RA Barrell and BA Oppenheim. Glycopeptide resistant Enterococci isolated from uncooked meat. J. Antimicrob. Chemother. 1996; 38, 908-9. TM Coque, JF Tomayko, SC Ricke, PS Okhyunsen and BE Murray. Vancomycin-resistant enterococci from nosocomial, community and animal sources in the United States. Antimicrob. Agents Chemother. 1996; 40, 2605-9. S Miyadoh. Research on antibiotic screening in Japan over the last decade: A producing microorganisms approach Actinomycetologica 1993; 9, 100-6. L Mellouli, RBA Medhi, S Sioud, M Salem and S Bejar. Isolation, purification and partial characterization of antibacterial activities produced by a newly isolated Streptomyces sp. US24 strain. Microbiol. Res. 2003; 154, 345-52. J Lacey. Actinomycetales: Characteristic and Practical Importance. Edited by G Sykes and F Skinner. The society for applied bacteriology symposium series. Academic press London-New York No. 2, 1973. JC Yoo, JM Han, SK Nam, KS Baik, JS Jo and CN Seong. Characterization of a Streptomyces isolates producing the potent cytotoxic substance, nonadecanoic acid. J. Microbiol. 2002; 40, 178-81. F Korn-Wendish and HJ Kutzner. In: A Balows, HG Truper, M Dwokin, W Harder and KH Schleifer (eds.). The prokaryotes. Springer-Verlag, New York, 1992, p. 921-95. SA Waksman and AT Henrici. The nomenclature and classification of the Actinomycetes. J. Bacteriol. 1943; 46, 337-41. MT Madigan, JM Martiko and J Parker. Antibiotic: Isolation and Characterization. In: Brook Biology of Microorganisms. 8th ed. Prentice-hall international Inc. New Jersey, 1997, p. 440-2. M Oskay, AU Tamer and C Azeri. Antibacterial activity of some Actinomycetes isolated from farming soils of Turkey. African J. Biot. 2004; 3, 441-6. RP Elander. Microbial screening, selection and strain improvement. In: Basic Biotechnology. Academic Press, London, 1987, p. 217-51. ME Bushell, SL Bell, MF Scott, K Snell, RE Speir, N Wardell and PG Sanders. A three-phase pattern in growth, monoclonal antibody production and metabolite exchange in a hybridoma bioreactor culture. Appl. Environ. Microbiol. 1993; 12, 23-34. F Fawaz and GH Jones. Actinomycin synthesis in Streptomyces antibioticus. Purification and properties of a 3-hydroxyanthranilate 4-methyltransferase. J. Biol. Chem. 1988; 263, 4602-6. GH Jones. Actinomycin production persists in a strain of Streptomyces antibioticus lacking phenoxazinone synthase. Antimicrob. Agents Chemother. 2000; 244, 1322-7. A Kelner. Studies on the genetics of antibiotic formation: the induction of antibiotic-forming mutants in Actinomycetes. J. Bacteriol. 1949; 57, 73-92. T Shomura, N Ezaki, T Tsuruoka, T Niwa, E Akita and T Niida. Studies on antibiotic SF-733, a new antibiotic. I. Taxonomy, isolation and characterization. J Antibiot (Tokyo). 1970; 23, 155-61. P Sujatha, K Raju and T Ramana. Studies on a marine Streptomycete BT-408 producing polyketide antibiotic SBR-22 effective against methicillin resistant Staphylococcus aureus. Microbiol. Res. 2005; 160, 119-26.